Diamonds big enough to be worn by Hollywood film stars could be raining down on Saturn and Jupiter, US scientists have calculated. New atmospheric data for the gas giants indicates that carbon is abundant in its dazzling crystal form, they say. Lightning storms turn methane into soot (carbon) which as it falls hardens into chunks of graphite and then diamond. These diamond “hail stones” eventually melt into a liquid sea in the planets’ hot cores, they told a conference. The biggest diamonds would likely be about a centimetre in diameter – “big enough to put on a ring, although of course they would be uncut,” says Dr Kevin Baines, of the University of Wisconsin-Madison and Nasa’s Jet Propulsion Laboratory. He added they would be of a size that the late film actress Elizabeth Taylor would have been “proud to wear”. “The bottom line is that 1,000 tonnes of diamonds a year are being created on Saturn. “People ask me – how can you really tell? Because there’s no way you can go and observe it. Astronomical Society in Denver, Colorado, alongside his co-author Mona Delitsky, from California Speciality Engineering. Uranus and Neptune have long been thought to harbour gemstones. But Saturn and Jupiter were not thought to have suitable atmospheres. Baines and Delitsky analysed the latest temperature and pressure predictions for the planets’ interiors, as well as new data on how carbon behaves in different conditions. They concluded that stable crystals of diamond will “hail down over a huge region” of Saturn in particular. “It all begins in the upper atmosphere, in the thunderstorm alleys, where lightning turns methane into soot,” said Baines. By a depth of 6,000km, these chunks of falling graphite toughen into diamonds – strong and unreactive. These continue to fall for another 30,000km – “about two-and-a-half Earth-spans” says Baines. “Once you get down to those extreme depths, the pressure and temperature is so hellish, there’s no way the diamonds could remain solid. One possibility is that a “sea” of liquid carbon could form. “Diamonds aren’t forever on Saturn and Jupiter. But they are on Uranus and Neptune, which are colder at their cores,” says Baines. 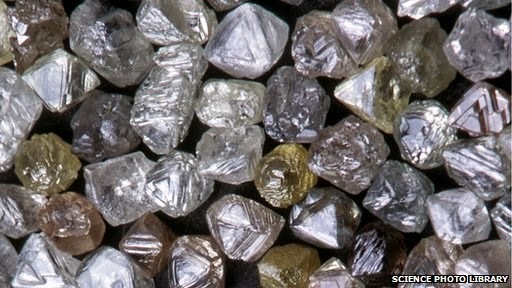 The findings are yet to be peer reviewed, but other planetary experts contacted by BBC News said the possibility of diamond rain “cannot be dismissed”. “The idea that there is a depth range within the atmospheres of Jupiter and (even more so) Saturn within which carbon would be stable as diamond does seem sensible,” says Prof Raymond Jeanloz, one of the team who first predicted diamonds on Uranus and Neptune. However Dr Nadine Nettelmann, of the University of California, Santa Cruz, said further work was needed to understand whether carbon can form diamonds in an atmosphere which is rich in hydrogen and helium – such as Saturn’s. “Baines and Delitsky considered the data for pure carbon, instead of a carbon-hydrogen-helium mixture,” she explained. Meanwhile, an exoplanet that was believed to consist largely of diamond may not be so precious after all, according to new research. The so-called “diamond planet” 55 Cancri e orbits a star 40 light-years from our Solar System. A study in 2010 suggested it was a rocky world with a surface of graphite surrounding a thick layer of diamond, instead of water and granite like Earth. But new research to be published in the Astrophysical Journal, calls this conclusion in question, making it unlikely any space probe sent to sample the planet’s innards would dig up anything sparkling. Carbon, the element diamonds are made of, now appears to be less abundant in relation to oxygen in the planet’s host star – and by extension, perhaps the planet. “Based on what we know at this point, 55 Cancri e is more of a ‘diamond in the rough’,” said author Johanna Teske, of the University of Arizona.